I want to go into a little extra detail about those last two songs. 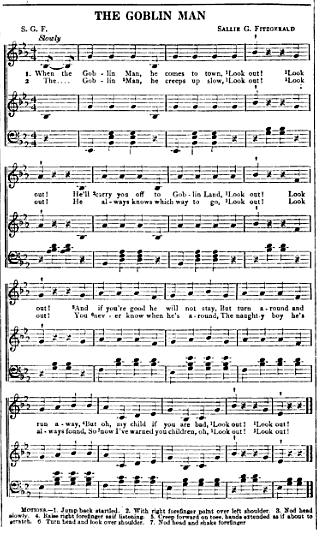 “Jack-O’-Lantern Song” is credited to an unnamed Canadian teacher, which could potentially disqualify it from a list of public domain sheet music due to differences in Canadian copyright law. I feel certain its copyright has expired in Canada because the earliest version I could find appeared in 1901 and copyright over there lasts the life of the creator plus 50 years. I am not a lawyer, but I feel very confident the mystery teacher passed away well more than 50 years ago. I also presented that link because it has some great tips on performing the song! 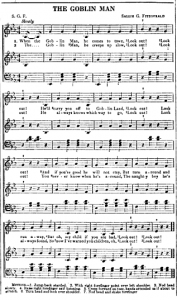 It also turns out the song “Pumpkins in the Cornfield” is based on is actually far older than the “Pig in the Parlor” version! Which is great news, because “Pig in the Parlor” is full of loathsome Irish stereotypes. Now people can use “Pumpkins in the Cornfield” without a shred of guilt and further push the offensive alternate lyrics into the forgotten trash heap of history. That’s right, just as I detailed in my article on “Spirit Rappings,” I made sure only to share music that is in the public domain in the hopes people will share their performances online. All of my comments and disclaimers from the article apply to this one as well. Although we think our information is solid, at the end of the day we have to admit that we’re not lawyers. Our musings are worth exactly what you paid for. We’re just sharing this since this is interesting and those seeking to benefit from allegedly public domain works should consult at least one lawyer before doing so. Gravedigger’s Local 16 is not to be held responsible for anything that may occur (be it good or bad) as a result of visiting any of the links in this article or using the material noted here. Attempt at your own discretion.